Step 1: Gather your ingredients — one base color and two complementary sparkly things — and apply two coats of your base color over a base coat like this. It doesn’t really matter what colors you choose, but here I went for a purple pastel and gold-ish scheme. Step 2: When your base color is dry, cover half of each nail with Scotch tape in a haphazard-to-painstakingly-specific fashion, depending on the severity of your particular anxiety disorder. Starting from my left pinky, I chose to cover the lower left quadrant of the nail, then the upper right quadrant of my ring fingernail, then the lower right quadrant of my middle nail, and so on. I taped my left hand first and then tried to mirror the direction of the tape on my right hand. But honestly, you could just slap tape wherever and it’ll still be fine and you’ll probably live a happier life. Step 3: Paint over the tape using the sparkly polish. 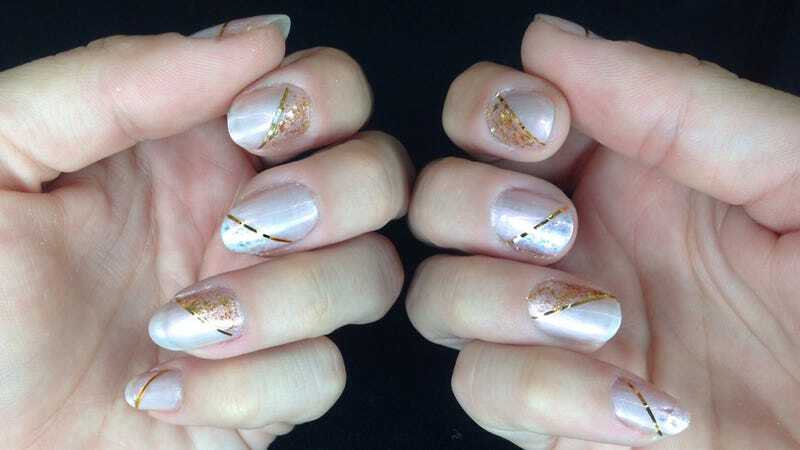 I chose to alternate nails, so only my pointer and ring fingers have the gold sparkles; the rest have the iridescent. Remove the tape while this polish is still a little damp. Allow it to dry. Step 4: Apply striping tape along the edge of the glitter. This doesn’t have to be exact. I use nail clippers to trim the tape after it’s placed. Step 5: Apply a top coat. Go to a disgusting outdoor music festival, or to work, or to bed.